It’s a busy day in the Tiny Winery today! It’s 449 days since our beautiful Shiraz arrived in the winery. It’s a busy day in the Tiny Winery today! Shout out to Carolyn for taking up where Stu left off as today’s Assistant Winemaker! It’s 449 days since our beautiful Shiraz arrived in the winery. We’re still going through the processs of élévage. We take more time during this phase than many and like to see our wines through two winters. Many people by now will have already bottled their 2017 Shiraz. Too short a period of ageing pre-bottling tends to result in raw wines that have developed and harmonised. They’ve been a few things that have taken us off course in making this wine. Sulphide during fermentation required active management and early racking of gross lees. Delays in the completion of malolactic fermentation stopped us racking the wine as we normally would. Instead of taking a couple of weeks it took a year. Exposing an unsulphured wine to oxygen during malolactic fermentation is not great for the bacteria, they just don’t like it, and, it can turn the wine volatile, so we held off. If we’d added sulphur it would have killed the malo bugs. Since the completion of Malolactic fermentation we’ve started working on the wine. About a month ago we transferred the old barrel into the tank of wine, half the wine was in tank after that move, and, then transferred the wine in the 1 year old barrel into the old barrel. The aim to introduce a little oxygen, to help bring the wine forward, to add a little sulphur to protect the wine, and, to stop any further influence of the newest barrel on the wine. You really do have to be agile in your approach to making a wine and work with the cards you’re dealt. After tasting the wine yesterday we’re taking our next step. We’re combining racking all of the wine, really blending portions, transferring the wine in tank to a bigger tank, blending in the wine from our 2nd newest barrel (a 3 year old barrel) with it and adding a little sulphur. Following that we’ll transfer the wine from the other barrel out and into the barrel we just emptied, introducing oxygen and adding sulphur. So we’ll end up with 3/4 of the wine in Tank and 1/4 in barrel. We’re keeping the 1 barrel separate at the moment to allow for maturation in oak to occur, the wine in it was spent 13 months in the newest of the barrels and we’re not yet certain if we’ll put all of it in the blend. Helping the wine develop through today’s actions will help make the decision and blending exercise clearer for us as we’ll be working with a wine that is closer to the finished product. Instead of racking the wine, decanting only the clear wine and leaving the solids, we’re mixing the wine today and stirring up all the acid crystals in the wine. These are formed when naturally occurring tartaric acid bind to potassium and crystalises to form ‘wine diamonds’. Mixing them with the wine helps encourage crystallisation. Being the middle of winter here, the cooler temperatures will help too! After we’ve completed the process, we’ll leave the wine to come together for a while, taste it and decide what’s next. We’ll be hoping the fruit has developed, the raw edges have been taken off, the tannin softened a little, it’s already pretty good, and the wine harmonised. 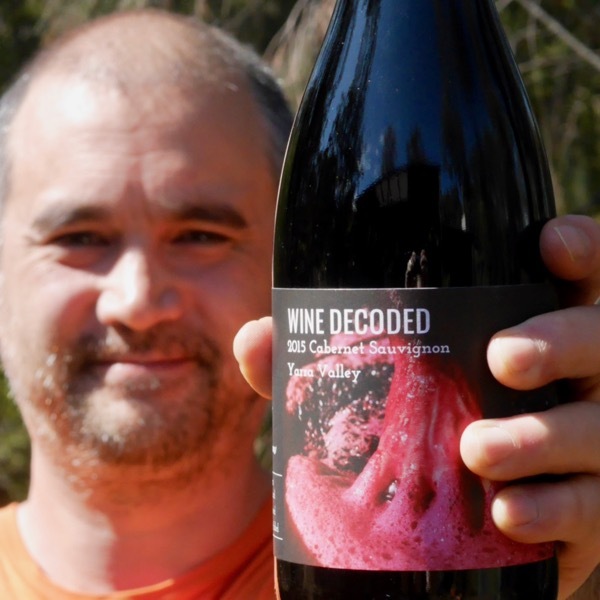 By the way we knocked back a bottle of the 2016 Wine Decoded Shiraz, to be released later this year, to try in context with the components of the 2017. Just quitely everyone had big smiles on their faces! The Wait is Over … Our 1st Wine Decoded Wine is Here!